The Human Factors Technology Centre (HFTC) is a multi-disciplinary research centre, housed in Cardiff University’s School of Engineering, and founded by the Schools of Psychology, Computer Science and Engineering. It is currently led by Director Prof. David Marshall (School of Compute Science) ably assisted by co-directors, Dr. Yulia Hicks (School of Engineering) and Dr. Simon Rusthon (School of Psychology). Its aim is to develop research in emerging and innovative areas that require collaboration between engineering and human sciences. 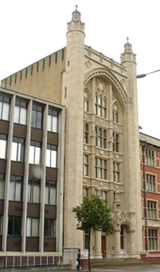 The centre was set up as a consequence of research funding from the Data and Information Fusion Defence Technology Centre, funded by Ministry of Defence, to research groups in Cardiff University. It was successful in being awarded a Science and Research Infrastructure grant of just under £1M from the Higher Education Funding Council for Wales that supported the development of tailor-made laboratory space. There is a synergy between the School of Psychology’s work on Human Factors and Human-computer Interaction, Human Vision and Visual Computing in the Schools of Computer Science and Engineering. In addition the HFTC has been supported by industrial grants from General Dynamics UK.